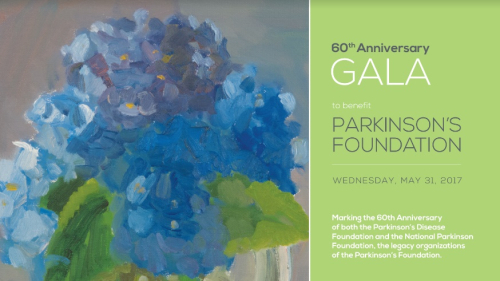 The 60th Anniversary Gala to benefit Parkinson’s Foundation will take place @ the Garden Terrace Room at the New York Botanical Garden in the Bronx, NY. The Gala marks the 60th Anniversary of both the Parkinson’s Disease Foundation (PDF) and the National Parkinson Foundation (NPF), the legacy organizations of the Parkinson’s Foundation and recognizes their strength in working toward a world without Parkinson’s together. For more information on the Parkinson’s Foundation and to purchase tickets, call (800) 457-6676 or visit www.pdf.org/gala. The 60th Anniversary Gala to benefit Parkinson’s Foundation will take place Wednesday, May 31, 2017 in the Garden Terrace Room at the New York Botanical Garden in the Bronx, NY. The Gala marks the 60th Anniversary of both the Parkinson’s Disease Foundation (PDF) and the National Parkinson Foundation (NPF), the legacy organizations of the Parkinson’s Foundation and recognizes their strength in working toward a world without Parkinson’s together.